It was wonderful to see Nannie. 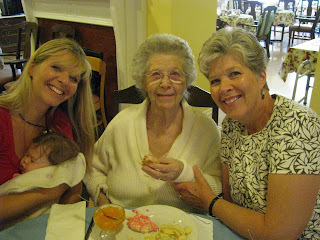 She'll be 95 this October, and while the years have taken their toll on her memory, she's still my Nannie. She was thrilled to meet Teyla (although I don't think she'll remember it), and she was "overcome" that we had come to see her. "This is the biggest surprise of my life!" she exclaimed time and time again. "I just don't know if I can take it!" Teyla and I flew home last night -- only to unpack, do some laundry and repack for the Love Well Annual Up North Vacation. I'm typing this from the shore of Lake Superior, where we plan to spend the next few days taking in some serious fall color. Including -- especially -- pictures. AUGH! I just wrote a comment and it got lost. I said, What a great pic of the 4 generations of women all together, and it's fun to see the family resemblance between you all. Have a great vacation! I can't wait to see pics of the fall colour. I am so jealous! I went to college in Duluth, and fall makes me just ache for the north shore. Have a great trip! I love it that she was so excited. Even if she doesn't remember, it made her day. And you'll remember that. I'm so jealous that you're up north. This fall has been so great. Enjoy! And I can only imagine how beautiful the lake must be! Kelly! I have just spent awhile reading through a goodly portion of your blog. I'm so looking forward to meeting you in a few weeks at the MN Get-together. I'm jealous, It's so so beautiful right now in MN. Even better up there, I'm sure! Have fun. That 4 generation shot is a keeper, it was awesome that you made the trip!